Is it morally wrong to drink an 89p bottle of good beer? My local little Tesco supermarket – and probably your local Tesco as well – is currently selling for 89p a 50cl bottle of 3.8 per cent abv amber ale made with Fuggles and Goldings hops at a 140-year-old Midlands brewery. What is worse, or better, depending on which direction you wish to drive in from, is that it’s an excellent beer, a very fine example of a classic English session bitter, only lightly carbonated, balancing with calm skill on the knife’s edge between mouth-filling bitter and delicate sunny malt sweetness, a long afternote bringing a reminder of oranges and a touch of currant cake, as moreish as any brewer could wish. If every bottled beer were as good, Britain’s drift towards much more drinking at home would become a stampede. But the price! Beer hasn’t been that cheap in a pub for nearly 30 years. It’s a crime against economics, and a threat to every other brewer, great and small, trying to scrabble a living selling good beer on thin margins. How and where is anyone making a profit? The duty alone has to be 35p a bottle, and the VAT 18p. I cannot believe the manufacturing and distribution are less than 20p a pop, leaving 16p for the retailer: a GP of 18%. A normal business would go bust pretty swiftly on that kind of mark-up. Dear reader, how do I match the exceeding, and exceedingly cheap, pleasure I get from this beer with the guilt I wrestle to suppress, fearing that every bottle I buy pushes a Heriot-Watt graduate working for a small brewer utterly unable to compete on price with an 89p cracker closer to redundancy? So should I feel guilty about succumbing to Tesco’s massive discounting when perhaps worthier brewers and retailers are struggling? I don’t think so: there are not normally more than a few bottles left on the shelf when I call in, meaning super-cheapo Bank’s is replacing very little of the pricier beer I normally buy. And ultimately, morally, I suggest my duty as a family man is to maximise my pleasures as cheaply as possible, to leave more of my income to keep my wife and daughter in Pinot Grigio and “dark fruits”-flavoured cider respectively (yes, I know, but she’s a teenager: it’s what they all drink.) Pound for pint, this is one of the maximumest beery pleasures I’ve carried home for a very long moon. Thank you, Marston’s and Tesco, for taking me back to 1987. And no, I don’t believe good people are going out of business because I’m buying 89p beer: I think smart good people are finding themselves niches 89p beer doesn’t threaten. Marston’s brews a Newkie Brown clone for Aldi which comes — dun dun dunnn! — in clear glass bottles. So does Newkie Brown, of course, so if you’re going to make a clone you’d have to copy that aspect too: and as very few people know that beer’s from Marston’s I suspect the brewers don’t care too much if you discover it’s light-struck, something anyone drinking a Newkie Brown clone is extremely unlikely to do. There’s only so much shelf space the supermarkets can devote to beer – by capturing facings like this, some producers can deny others the chance to bring their beer to this market at all. Obviously, we don’t do anything “wrong” when we buy it, but a more interesting question might be whether these producers and retailers are doing something “wrong” (i.e. anti-competitive) when they combine to sell it. Just a correction: the VAT would be 15p, not 18p. Unfortunately Martyn, the vast majority of beer drinkers do not share your views as to the quality of Marston’s output, hence the reason they have to flog it off dirt-cheap – its the only way they can get rid of it. You might consider £1.10 to be a bargain already, others clearly didn’t, hence the need for further reduction..
Just think yourself lucky that your tastes are so different from mainstream tastes and the significant boost to your personal consumer surplus that this affords you. 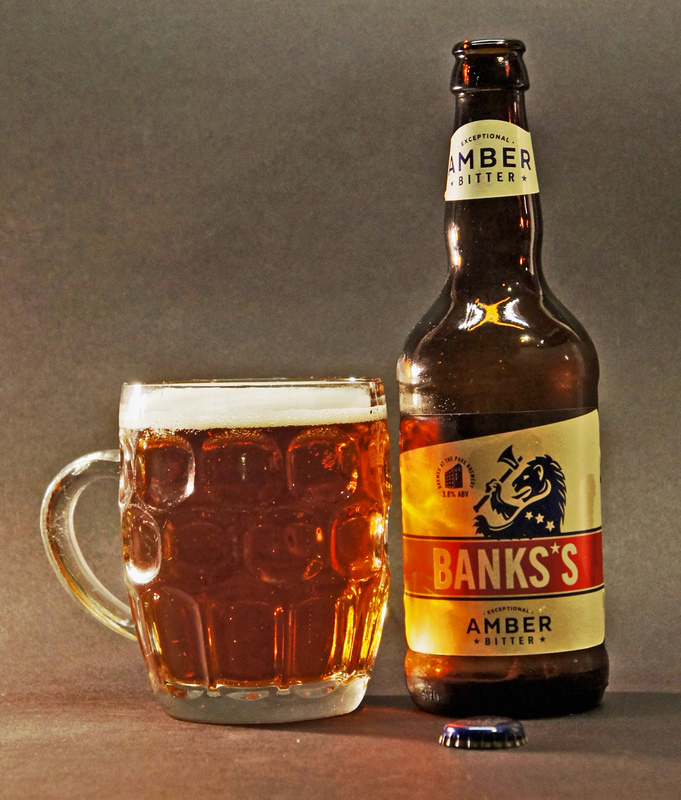 Bank’s Bitter in their pubs now has the same branding as “Amber Bitter”. Whatever your opinion of the beer, and the values and vicissitudes of buying cheap verses suppressing well brewed product… supermarket chains respond to computer driven algorithms (I was tempted to mistype AlGorerhythms). So if a product isn’t moving, it gets discounted. I benefitted from this two years ago when a ‘franchise’ quick-stop type place was selling US sized 22oz bottles from a brewery for $1.88, even though new beer was being stocked by same brewery – a premium ale at $5.99… I cleaned out 12 shops and had beer for months. The brewer’s in question lost no money – the idiots running the corporation of franchises lost money. I got a couple of bottles of this with my Tesco order last night and concur with Martyn that it is a decent drink. That isn’t a safe assumption with the cheap end of the market (Lidl had Shepherd Neame Ace Ale at a similar price recently; let’s just say I’m glad I didn’t stock up. The supermarket is probably looking at it as a loss leader. Buy a few from the bargain end and you don’t mind getting something more expensive too. They don’t have enough stock of the cheap stuff for it to dent their overall profits and they have plenty of higher profit items available to tempt you. My experience of Tesco is that they normally have one or two at the lowest price, a handful more a bit higher and then a wide swathe covered by their 4 for £6 offer. I don’t imagine they – or the brewers – are losing out. I would very much doubt that this is being used as a loss leader. In fact, if you look round the supermarket shelves there are plenty of other non-enthusiast beers being sold at similar price points. The margins may not be great, but it’s still profitable business. The duty plus VAT on duty come to 41.9p, so there’s still plenty of headroom for both producer and retailer to make a profit on it. Yes, if the beer made itself and walked to the shop. That would be true if the shop received a delivery only containing Banks Amber. That probably only makes up a small proportion of the delivery to any one store and so you need to consider the aggregate profit or loss for the whole shipment – which we can’t do without more data. The same is true at the brewery – they couldn’t survive on just that one beer at that price but they balance the costs across their range. Yes, cross-subsidy is one way that predatory pricing is funded. Or why not try to avoid purchasing beer from big supermarket chains? They are are notorious for screwing their suppliers down on wholesale prices and for their authoritarian payment terms! Buy directly from breweries when possible. The rest of the time, buy from decent independent beer shops, if you have one nearby. It will cost you more – but surely that’s because the breweries are getting a better deal. As always, in Ireland it’s a bit more expensive. The Aldi Marstons bottles are retailing for €1.79. The Newkie Brown clone and the amber ale are utterly delicious and I thought they were a bargain until I read this post. Bass has been £1 a bottle in Asda for, what, three years? The pick of several others around that price point. Nice idea Lord Crumb except … I don’t have much money. I want to buy individual bottles, not cases. I don’t have a bad independent beer shop near me, never mind a good one. When I am in such a shop elsewhere and they are charging 50% more for a beer than I could pay elsewhere, my thoughts turn more to the possibility that they are perhaps ripping people off rather than that supermarkets are screwing the breweries. Well said, Sir! We’re not all made of money, nor do we have independent bottle shops on our doorstep. And my local Tesco sells 4x500ml packs of cans of Bombardier, Bass and McEwans Export for £4, which all must have a similar margin. It’s not loss-leading, it’s not predatory pricing, it’s just the normal economics of the industry. Buy this all the time fom Aldi and love it. I realise I’m extremely late to the party here but the reason I found this site is, I was looking to see why I can’t get hold of it at any of my Tesco’s. Do Banks have a supply problem? We are in Aug ’18 now and it’s now a princely 90p. I go in and buy 10 at a time – it’s a lot of beer for £9.00 – but I never clean them out. Anyway, it’s not just the cost that attracts me – I think for the ABV it’s a thoroughly decent tasting beer. I can’t do all the 5.2 (and some) abv stuff on a school night anymore! I was delighted when Lidl Croatia started doing the Marston brands two years ago and regularly, albeit at intervals, since. I marvelled at how it could come all the way out here, with everyone making money and sell at, initially, the equivalent of 55p a 500ml bottle, although latterly it has been nearer a quid. The lack of duty must help, but still.. I live in Wolverhampton where this beer is stocked by Aldi Lidl and Asda for 90p give or take 1p yet at the brewery shop is lumped in with the 8 for £10 deal so in effect costs £1.25 there but some of the other stuff there such as Youngs bottle conditioned Golden Ale is a bargain. Discovered this a couple of weeks ago in my local Tesco, can’t believe I hadn’t tried it sooner. An excellent beer and as you put a proper session pint. It doesn’t force itself upon your pallet like so many of the ‘craft’ beers these days, just delivers an excellent, well rounded flavour that I can drink and drink.